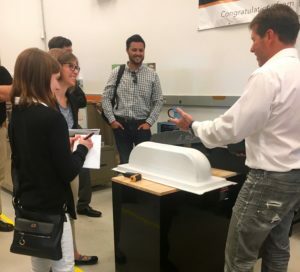 Catalysis had the pleasure of welcoming Stephanie Hendrixson, Senior Editor for Additive Manufacturing Magazine, to our facilities to learn more about who we are and what we do. So, who is Additive Manufacturing Magazine? Additive Manufacturing Magazine focuses their coverage on writing articles about manufacturers that are using 3D printing technologies in innovative ways. 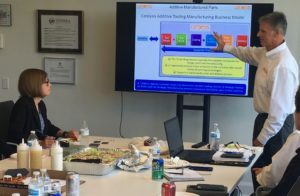 They are looking for manufacturing leaders, like Catalysis, who are bringing disruptive ways of operation to the Additive Manufacturing industry. 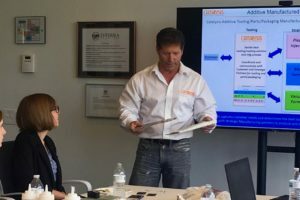 During the initial portion of this meeting, we explained how CEO & President, Darrell Stafford and Director of Business Development, Rick Shibko combined their individual expertise to develop the unique foundation of Catalysis. We also used this time to speak about how Catalysis takes on an agnostic approach to 3D Printing and how we offer the complete solution for our customer’s tooling. Rick Shibko explaining to Stephanie Hendrixson how the Agnostic Approach and Complete Solution of Catalysis makes them unique. Darrell Stafford showing Stephanie Hendrixson the different tooling Catalysis uses. The second part of our meeting included giving Stephanie Hendrixson a “VIP” tour of our facilities. She met our amazing team and saw examples of the incredible work our manufacturing team does. Together, we have a strong team who offers a wide range of skill sets to our customers! Jared is responsible for coordinating tooling design. He has over 20 years of experience in design and styling, has worked at Honda and other different industries. Darrin has many, many years of experience as a machinist and tool maker. If he can’t make it, nobody can! Jack is currently a Mechanical Engineering student and is in charge of running our Advanced Manufacturing Center. Also in attendance was Mason Estep, from Smoketech, who explained the benefits of Catalysis Additive Tooling from a customer’s perspective. Giving Stephanie Hendrixson a tour of our facilities and showing her different tools and explaining how the different tools work. 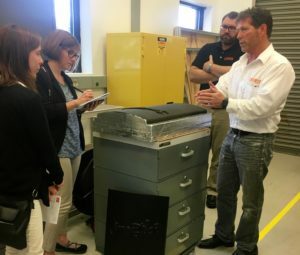 Thank you to Stephanie Hendrixson, Senior Editor at Additive Manufacturing Magazine, for taking the time to travel to Catalysis to learn more about what we do & explore our facilities. We are honored to have welcomed Additive Manufacturing Magazine to Catalysis to further understand our business and publish an article!